You may have heard that putting fresh wood chips on your garden is a bad idea. Wood contains lots of lignin, which binds to nitrogen and won't let it go for months or years. When soil microorganisms begin decomposing the wood chips, there isn't any nitrogen for them to eat, so they have to take nitrogen out of the soil. The result is that plants whose roots are in the soil under fresh wood chips can't get any nitrogen and they struggle to grow. After a while, the wood chips break down to the point that they release nitrogen rather than hogging it --- then your plants get happy. Although leaves contain much less lignin than wood, the same effect can occur. Leaves that contain more than 15% lignin are difficult to decompose. Although I couldn't find a comprehensive list of the percent lignin in all the tree species in my woods, I think I can use a pretty simple rule of thumb --- if leaves feel thin and melt into the ground within a couple of months, they clearly have low lignin levels. Trees like oaks, beech, and sycamore with thick leaves that stick around for a long time have high lignin levels and might leach nitrogen out of my soil before giving any back. I'll have to wait to see the results of my winter leaf mulching, but I suspect that the thin leaves I've put on my garden beds will melt in by spring and enrich the soil. 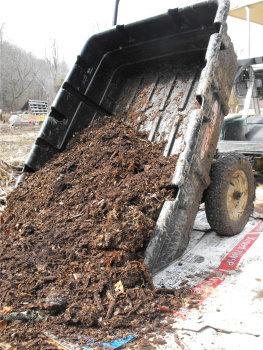 The thicker leaves may need to be raked back or supplemented by urine and manure. Next year, I'll be more prepared and will use oak, beech, and sycamore leaves as mulch over manure in my perennial plantings while reserving leaves from maples and tulip-trees for my vegetable garden. Mafongoya, P.L., K.E. Giller, and C.A. Palm. 1998. Decomposition and nitrogen release patterns of tree prunings and litter. Agroforestry Systems. 38: 77-97.